CAST BIOS — SYMPATHY FOR THE DEVIL? "We were very intense. We said things that people found completely unacceptable"
Without the enthusiastic and generous help of Timothy Wyllie, the making of this film would have been next to impossible. Timothy was one of the founder members of The Process and ‘guinea pig’ for his friend Robert De Grimston’s developing psychotherapeutic ideas. The former architecture student would go on to design the interior of the cult’s Mayfair mansion, and become the lead designer for the ground-breaking Process magazine. "I could see how nervous they made people - that's what I liked!" Dubbed ‘The Pope of Trash’ by William Burroughs, John Waters is an American film director, screenwriter, author, actor, stand-up comedian, journalist, visual artist, and art collector, who rose to fame in the early 1970s for his cult films. He encountered The Process when he was a penniless film-maker living in New Orleans. "There's no doubt in my mind that Robert De Grimston was channelling something"
Genesis Breyer P-Orridge is an English singer-songwriter, musician, poet, performance artist, and occultist. P-Orridge rose to notability as founder of the COUM Transmissions artistic collective, which operated in Britain from 1969 to 1975. They fronted the pioneering industrial band Throbbing Gristle between 1975 and 1981 and the experimental band Psychic TV from 1981 to 1999. P-Orridge is also a founding member of Thee Temple ov Psychick Youth, an informal occult order s/he established in 1981. Genesis Breyer P-Orridge first witnessed members of The Process on the streets of London in the late 1960s. Although he was never a member, he was highly influenced by the Process Church of the Final Judgment and modelled some aspects of the Temple ov Psychick Youth (TOPY), which he co-founded in 1991, after the Church. He retains a friendship with former Process members. "I do know that some people were shocked and scared out of their minds"
Previously a successful business consultant, the charismatic Irishman became a leading member of The Process. Malachi was editor of the group’s magazine and arguably the ‘face of The Process’ – frequently put forward to deal with the often skeptical media. Credited with ‘inspiring’ George Clinton’s Funkadelic Album ‘America Eats Its Young’. "Rolling Stone thought we were into devil worship"
Recording both as Parliament and Funkadelic, George Clinton revolutionized R&B during the ’70s, twisting soul music into funk and adding acid drenched influences. Clinton was introduced to The Process Church of the Final Judgment by his road manager and struck up a friendship with several members who attended recording sessions and concerts. In their unique uniforms, the cult devotees were sometimes mistaken for members of the flamboyant Funkadelic group. In 1971, Funkadelic released the LP ‘Maggot Brain’ – considered to be one of the best and most influential albums of the ‘70s. The album featured songs flavoured with Process theology and contained Process writings printed in the LP's gate-fold sleeve. They followed this up in 1972 with double album ‘America Eats Its Young’ - another hugely potent album flavoured with Process philosophy. Hope grew up in South Africa, the daughter of renowned professor of architecture Leonard Thornton White who was the town planner for Nairobi in Kenya and Port Louis in Mauritius. She moved to London to study and practice architecture before being introduced to The Process in their early days by her flat-mate. She describes the effect the group had on her “previously I had felt like I had being living in a glass box with and The Process was able to shatter that box”. Hope gave up her life as an architect and left London with The Process in 1966 in search of an island to live on, eventually ending up on the Yucatan peninsula of Mexico. There the group had an intense spiritual wilderness experience and survived the deadly Hurricane Inez. Hope became ‘Mother Greer’, one of the cult’s inner circle and an important matriarchal figure. 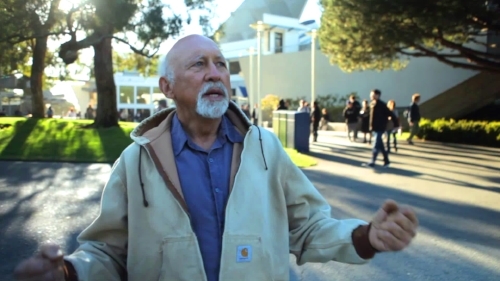 "Anytime you use the word 'Satan', you're gonna get a weird response"
Sammy Nasr was a student at San Francisco State University in the late sixties during a time of great activism on the campus and in the city. He encountered two members of The Process preaching on the university campus, “they were dressed head to toe in black and had black capes and they had two big German Shepherd dogs – one named ‘Satan’ and one named ‘Lucifer’. They were preaching that the world was going to end and that there was to be a unity between Christ and Satan – they had fire in their eyes”. Inspired by the group’s message and by the opportunity for adventure, Sammy gave up everything to follow them. He became ‘Father Joab’ a senior member of the inner circle and party to the secrets of the cult. As the ‘unofficial archivist’ of the former members, he has a large collection of photographs and artefacts which he kindly shared to enable the making of this film. "This was so wild, so weird, I was just stretching my mind out to even understand what it was they were saying"
In 1966, daughter of artist Sir John Verney, rebellious nineteen year old Sabrina Verney left her privileged background to join the thirty people and six German shepherds that made up ‘The Process’ in the Bahamas where they were searching for a place to continue their ground-breaking psychological research, a place far away from the notoriety of being The Mindbenders of Mayfair, as the tabloids called them. Later the search took Sabrina and the group to Mexico City, then a remote beach in Yucatán. They established an existence honed to essentials, survived a hurricane, and experienced bizarre psychic phenomena. Concerned for his daughter’s safety, Sir John arranged for Sabrina to be extradited from Mexico along with 2 other younger members and experience Sabrina describes as ‘like having the two halves of my body ripped apart’. Sabrina passed away in 2014 after having contributed her wit and brilliance to this film. "I don't think anybody met The Process who wasn't a little bit scared by them"
Edward first encountered The Process as a teenager in 1967 at the famed ’14-Hour Technicolor Dream’ event at London’s Alexandra Palace. Immediately intrigued and impressed, he became a regular at the ‘brainwashing’ cult’s Mayfair HQ. Eventually joining the group and relocating to Toronto in Canada. "When you come to New Orleans, we talk to strangers - the stranger the better"
Emmett grew up in New Orleans and was a young teenager when he met the group during their early years in the US. His mother (possibly concerned that he was in danger of going off the rails) suggested he visit The Process in their newly formed French Quarter chapter house. There he encountered the group’s leaders and as a youngster was accepted by its members. He travelled to join them in London and several chapters in the US and Canada and had the name ‘Brother Mark’ bestowed on him – being told it meant ‘Hammer of God’. "It sounds bonkers but I learned things about myself"
John Harvey was in the Process for about a year from 1967 at their London Mayfair HQ during an exciting time in their existence. As Brother Zachary he waited tables at their coffee house "Satans Cavern", spoke at Speakers Corner, and was projectionist for some of their provocative weekend film screenings. "They were living in an abandoned factory...itg was like something from the Middle Ages"
Jan first met the members of The Process when they were experiencing 'miracles' at Xtul in the Yucatan Peninsula of Mexico. She was therefore an eye witness at one of the most formative times in the communities history. Although she never joined, Jan stayed in contact with the group as they moved around various US cities and saw many close friends join the group. "It was like something you would see in a Catholic Church but turned upside down"
AUTHOR OF ‘TURN OFF YOUR MIND: THE MYSTIC SIXTIES & THE DARK SIDE OF THE AGE OF AQUARIUS’. As Gary Valentine, Lachman was a founding member of the pop group Blondie and wrote the group’s first single “X-Offender” and “(I’m Always Touched By Your) Presence, Dear” which was a top 10 hit in the UK and Europe. Since 1996, he has lived in London where he is a full time writer. He is the author of more than a dozen books on the meeting ground between consciousness, culture, and the western inner tradition. "I said to my editor that I would be very interested in investigating this group"
Gaia Servadio is an Italian novelist, essayist and broadcaster and has lived in London since 1958. She made her journalistic debut in the then famous literary magazine Il Mondo and then worked for La Stampa, il Corriere della Sera,The Times, The Sunday Times, the Observer and the Telegraph Group. She has written on international politics, was a war correspondent, has had exhibitions of her paintings in Rome and Milan, some of which were sent to group exhibitions from Australia to France, she has been an expert on the Sicilian Mafia and she has lectured on a variety of subjects all over the world. Gaia infiltrated The Process in 1966 in order to write an article for the Telegraph Magazine and announced her true identity just before the group left London in 1966 in search of an island to form a community on. "It was all right out of a Dennis Wheatley novel"
Robert Irwin is a British historian, novelist, and writer on Arabic literature. Many of Irwin's novels focus on Arabic themes. This includes his first, the acclaimed dark fantasy novel The Arabian Nightmare. Later novels would focus on diverse subjects, such as British Surrealism (Exquisite Corpse) and Satanism in Swinging London (Satan Wants Me). Irwin attended the University of Oxford and encountered The Process in 1960s London. Interested in weird groups and the occult, Irwin attended several Process therapy sessions and was witness to the group’s notorious ‘Black Mass’ staged at their Mayfair HQ. "Conspiracy theorists were telling me that the REAL Satanists were The Process Church of the Final Judgement"
Lucien is the co-founder of The Satanic Temple, a group that has caught the attention of the global media. He was a witness to and a researcher into the 'Satanic Panic' and was influenced by the experiences and teachings of The Process. "The Beatles had a card carrying member of The Process as part of their organisation"
Simon is the author of ‘COMING DOWN FAST’ which charts Charles Manson's terrifying rise from petty-criminal drifter to one of the most recognisable icons in criminal history, and explores the long reach of his crimes that to this day, so vex and shock the public imagination. Nicholas Bullen is an artist and composer based in Birmingham, England. Working across a range of media (including sound, text, film, installation and performance), his work explores the transmutation of elements and systems of communication. He has a history of musical composition spanning more than 35 years (beginning as a founder member of the “extreme” music group Napalm Death at the age of 13), appearing on over 40 released recordings and performing (solo and collaboratively) internationally. His work has been performed or exhibited in the United Kingdom (including Tate Britain, Institute of Contemporary Arts, Hayward Gallery, Serpentine Gallery, Chisenhale Gallery and Arnolfini Gallery) and internationally (including Art Basel, White Columns, Creative Time, Schirn Kunsthalle, and MACBA).